Discussion in 'Android Questions' started by Makumbi, Apr 15, 2019. I explained previously the Sub ReplySMS does not get any / return data from the http job . Which in turn populates the Recievedsms db Table .. 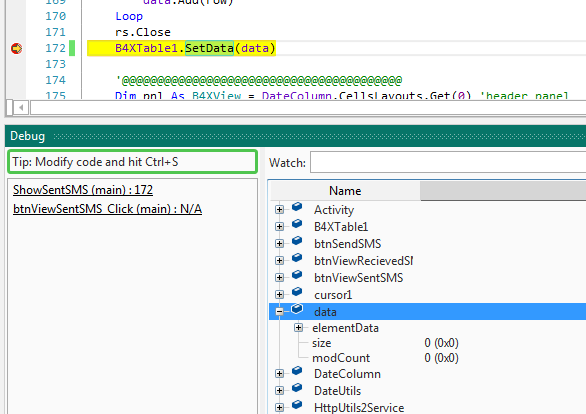 The Sent SMS button displays data in Sentmessages db Table ... I cannot see where / when it is populated with data. I can only see one single set of B4XTable.AddColumn(...... ) So I don't know where these phantom duplicate columns come from. I can see no changes to this sample whatsoever from when I uploaded it last.... Have you uploaded the correct one ?? If row(2) = Null Then row(2) = ""
Apologies ... I did open you previous upload in error. But apart from a few extra comments regarding reason for http calls I still see no change whatsever from last time. I still get no data to be displayed in the Table . The only data arrives in Activity_Create ... which is inserted in SMSlist db Table ... which is Not displayed anywhere. N0 .... I do not suddenly see data when they are enabled ... Just Duplicate columns ! Add columns once at Activity_Create only and get rid of those other AddColumn calls in both subs. We have already solved renaming that first column later. Get me some data and I might be able to help. In addition ... did you intake @Erels recommendation in post #2. ? I have just Sent an SMS and had confirmation the message was sent .... Still No Data. 1. Concentrate on getting data from the ReplySMS Sub which then populates the Receivedsms dbTable. Then we can display It in the Table. Presently there is NO data being recieved. Fix this problem first and forget all the other issues. They will get solved in due course. Again ... Did you intake @Erels recommendation in post #2. ? The sample has been tidied up a bit. Whether this is the the correct approach , I am unsure. Ideally I think the Table should be hidden until needed . At the very least your latest issue has been solved.